Most of Sean Connery’s tailored clothing in Goldfinger was first featured in the 1964 film Woman of Straw, which was made just before Goldfinger. Some of the suits fit the Woman of Straw setting much better than they fit Goldfinger. The brown houndstooth check suit is especially more fitting for Woman of Straw than it is for Goldfinger. 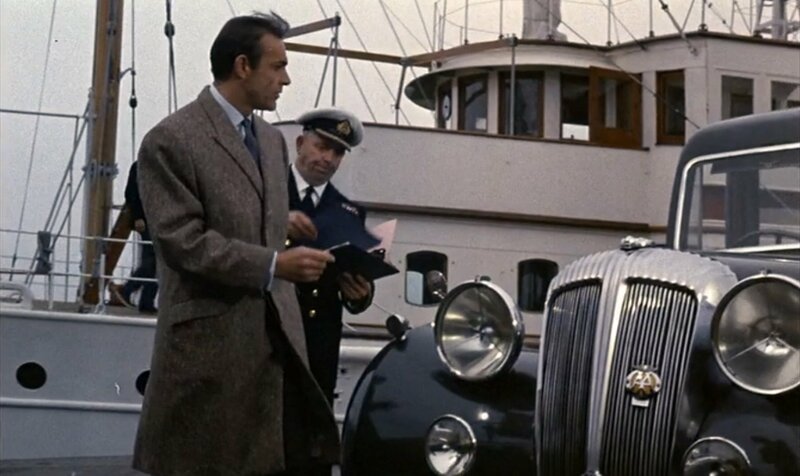 In Woman of Straw Connery wears the suit on a country estate, whilst in Goldfinger he wears it to the office for briefing from M. James Bond occasionally knowingly breaks the rules, and I certainly don’t just mean the rules of how to dress properly. Nevertheless, wearing this country suit to the office is not likely something M appreciated. In Woman of Straw we get to see this beautiful suit in its intended setting. The suit is a somewhat heavy mid brown and black fine houndstooth check made by Anthony Sinclair. The button two jacket is cut with natural shoulders, a draped chest and a gently suppressed waist. It has country details like slanted flap pockets with a ticket pocket and a long single vent. The jacket has four buttons on the cuffs. The trousers have double forward pleats, button-tab side-adjusters and tapered legs. Unlike in Goldfinger, Connery does not wear an odd waistcoat with this suit in Woman of Straw, though he does wear that beige waistcoat with his barleycorn tweed hacking jacket. The lack of waistcoat gives this suit a much different look than it has in Goldfinger. A blue shirt and blue tie also make the suit look much different than it does in Goldfinger. Blue offers a nice colour contrast to brown whilst cooling down the brown outfit to better flatter Sean Connery’s cool complexion, but for blue and brown to work together they need to have contrast in value. Dark brown and navy don’t go so well together, and neither does light brown and light blue. 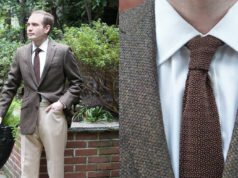 See the image below of the light brown overcoat and light blue shirt for a combination that doesn’t clash but doesn’t quite work so well either. But light brown with navy works and dark brown with light blue works. The latter is evident here. 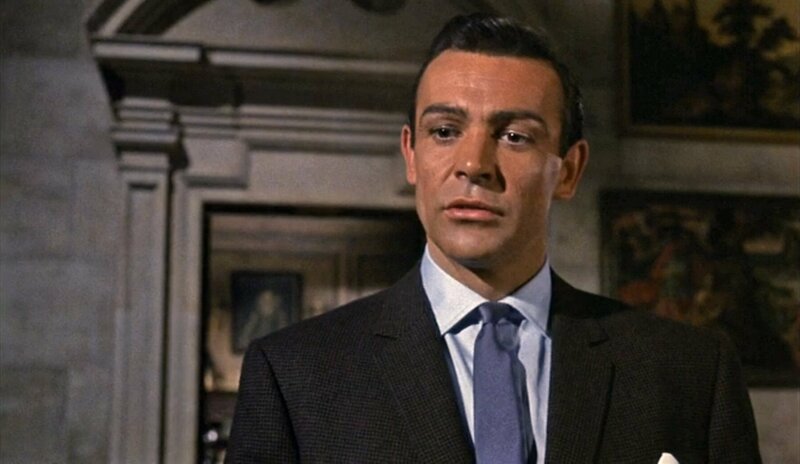 The pale blue shirt is made in the same style as Connery’s shirts in Goldfinger, with a wide spread collar, rounded double cuffs and placket stitched close to the centre. The steel blue repp silk tie is tied in a very small four-in-hand knot. 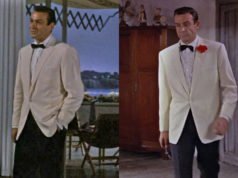 Like in Goldfinger, Connery wears this suit in Woman of Straw with a white linen handkerchief folded in a single point in his breast pocket. It may have just been left in the pocket from Woman of Straw when he wears the suit in Goldfinger. 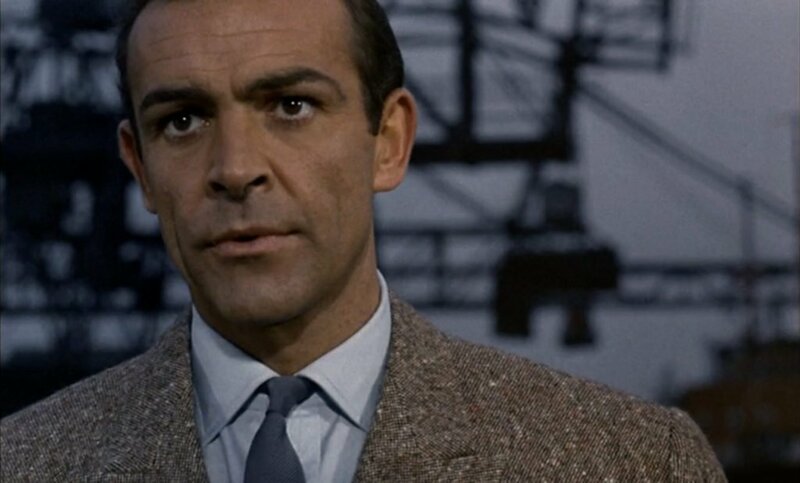 Over this suit Connery wears a light brown donegal tweed overcoat that is not worn in Goldfinger. The coat is like a cross between a single-breasted coat and a double-breasted coat in that it has a large overlap and peaked lapels, but the overlap isn’t as large as most double-breasted coats and there is only one column of buttons to fasten. The additional overlap is there for extra warmth. The coat has a fly front that hides the buttons, but if the one column buttons showed they would be off-centre. The coat has slanted hip pockets with flaps, a breast welt pocket, a single vent in the rear and plain cuffs with a short vent. The coat’s length is to just below the knee, making it a very warm, practical coat for the country. This overcoat is also made by Anthony Sinclair. Connery’s tie knots really were tiny in the 1960s. A small four-in-hand knot goes well with the narrower lapels of the era, and suits Connery’s no-nonsense, businesslike approach, but even so, they are ridiculously small at times. I agree with this. Prince Charles seems to favour this look too, which doesn’t really pair well with his liking for wide peak lapels. I also agree – the knots are too small, especially for a large man like Connery. They were about right in GF (allowing for the fashions of the day). I myself have always been partial to the larger, more luxurious knots of the Moore era. I think that at time the Americans had the most tiny ties. In Italy were about 7/7 and half cm. In UK about 7 cm. Another thing is that black or navy ties were above all a USA/UK (less in UK) thing. Italy and French ties had small patterns. Sorry, shoes are very difficult to see in this film. That’s unfortunate to know. Do black shoes still go well with the color of the suit even if its is worm in the country? I think that it’s best to wear dark brown shoes with this suit, especially in the country. 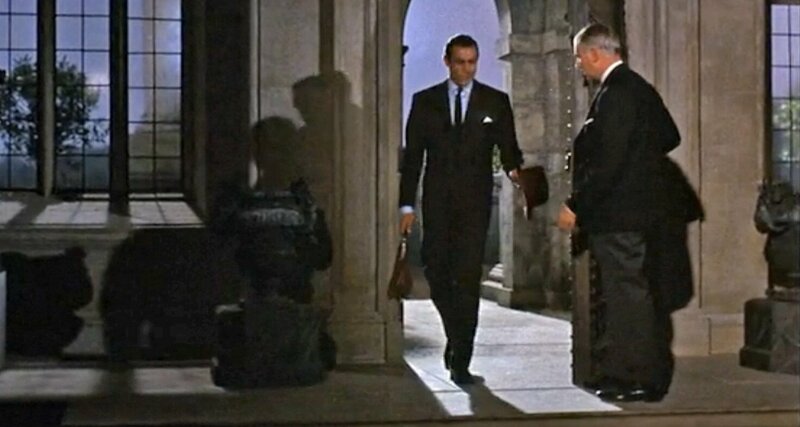 In Goldfinger Connery wears black shoes with this suit because he wears it in the city. Could this sort of jacket be worn as a sport coat? That’s great since I had a sport coat similar in color scheme to this jacket. I’m sure nearly all trousers would work and a light blue shirt like how Connery wears it in WoS. Would a white shirt work with this kind of jacket Matt? It depends on the brown. This one works with a white shirt, as we see in Goldfinger, but white can look harsh against many browns.